BullBuilder will be once again holding one of our legendary Race nights on Wednesday June 22nd in the South stand conference suite at Odsal Stadium. The evening will consist of 8 races shown on the big screens with tote betting and a chance to meet some of the young stars of the under 19 team as well as hopefully a few first team players and backroom staff. There will be a raffle with some great prizes and a prize draw with your entry ticket Doors will be open at 6.30pm, the betting desk at 7pm with the first race at 7.20. A pie and pea supper will be served after race 4 with a short address from a club representative. The raffle will be drawn after race 6 and the event should end at around 10.30 with the bar open a for a little later. Tickets are £5 and will be on sale from the club shop or contact David Lowdell on 01274 690301 or at the following link. Put on your walking shoes and help the Bradford Bulls Academy BullBuilder are looking for a legion of 100+ fans to join club chairman Marc Green and CEO Robbie Hunter-Paul in a Sponsored walk to the Bulls’ away game at Dewsbury on Sunday April 10th. BullBuilder are committed to our goals of enhancing the work of the Academy and Scholarship at the Bradford Bulls. The funds raised from this event are to contribute toward the redevelopment of the Academy changing rooms at Odsal, to make them a fit and proper place for our young talent to prepare to represent us. Current state of the changing rooms The walk is a 10.5 mile stroll, mostly down the traffic free Greenway with a couple of miles of road walking to the Rams’ Stadium. We will be leaving Odsal at 9.30am to arrive at the ground in plenty of time for kick-off with refreshment stations / checkpoints along the way and marshals at major road crossings. Transport back to Odsal will be arranged for those who need it. To put your best foot forward and join in the fun with Marc, Robbie and the rest of us, e-mail the event organiser at david@dlpbradford.com and we will send you your registration and sponsor forms. All walkers need to be registered by March 31st with a suggested donation of £10 to get the ball rolling and to help with transport, refreshments and other organisation costs. Please join us and help to give our young players facilities to be proud of. To join BullBuilder visit our website at http://www.bullbuilder.co.uk/join/, or contact us at Bradford Rugby League Supporters Society Ltd, Suite 2 Buttershaw Works, Buttershaw Lane, Bradford, BD6 2DD. BullBuilder, the Bradford Bulls official supporters trust have been boosted by the backing of Bulls official sponsor Provident for their Dinnertime in the Park event taking place in Bradford on Wednesday 3rd June. The event, which takes place at the Pavilion Café in Centenary Square, will feature a buffet meal and auction of RL memorabilia and other great prizes plus a free prize raffle and a chance to meet a host of ex Bradford greats such as Henry Paul, Deryck Fox and Leon Pryce. Half of all proceeds will go to BullBuilder who use it to provide financial assistance to the club’s academy teams on top of what is provided by the club. Indian, English and Mediterranean food and drinks will be provided by the Pavilion Café and their partner the award winning Deeva restaurant. The event takes place at the Pavilion Café in Centenary Square at 7pm on 3rd June. Tickets are £20 per person, with £10 of each ticket going to BullBuilder. Tickets are available from the Bulls ticket office (cash only) or Pavilion Café reception or email info@performancedg.com or ring 07958 728490. Max’s father Paul will also be there and he explained that distance is no barrier to his commitment to the Bulls cause. Paul said “Max is a really committed supporter. He’s also, like me, a member of BullBuilder, the Bulls official supporter’s trust, who provide funding for the Bulls Academy Team for those extras over and above what the club provide. He’s sold Golden Gamble tickets before home games too and is a really passionate fan.” Max said “I just like to do my bit for the club I love. 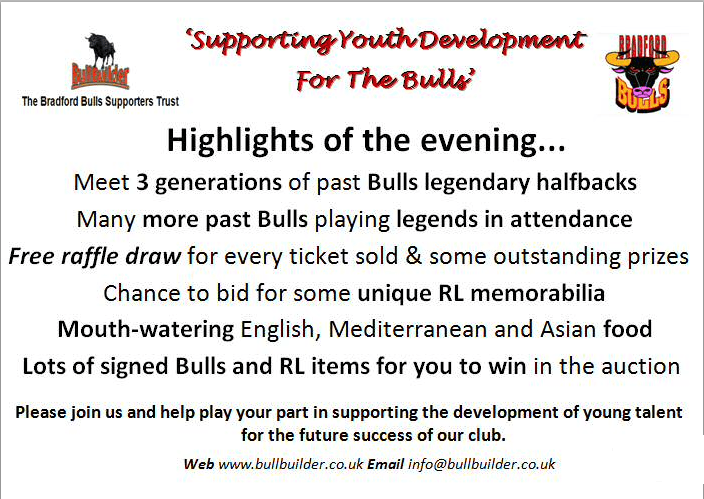 I’d urge others to get involved with BullBuilder if they can as it’s a great way to support the club. We’ve had some tough times in recent years but now we’re on the up again.” BullBuilder are hosting a Dinnertime in the Park event at 7pm on Wednesday June 3rd which will feature an auction and raffle accompanied by food and drinks at the Pavilion Café in Centenary Square. A number of ex-Bulls and Northern players will be there. Tickets are £20 per person, with £10 of each ticket going to BullBuilder. Tickets are available from the Bulls ticket office (cash only) or Pavilion Café reception or email info@performancedg.com or ring 07958 728490. Bulls fans will get a unique chance to meet three decades worth of club halfbacks at the BullBuilder Dinnertime in the Park event on Wednesday 3rd June. The club’s ex-players association put its weight behind the event after being contacted by BullBuilder, the Bulls' official supporter’s trust, who provide extra funding for the club’s academy teams. Event organiser Michael Barker said “It’s great to have the backing of the ex-players association and we are expecting Deryck Fox, Andy Robinson and Robbie Hunter-Paul to be at the event along with a number of other great ex-players. There will be an auction featuring some really top quality items plus a free prize draw and raffle. Whether people want to bid for things or not it will be a fun event with top quality food and drink all included." Also in attendance will be Bulls Head of Youth John Bastian and Under 19s' coach Matt Diskin plus several of the club’s top academy players. BullBuilder’s aim is to provide financial assistance to the club’s academy teams on top of what is provided by the club to give the players. Past contributions have taken the form of floodlighting, gym equipment, IT equipment and outward bound courses with the RAF. The Bradford Bulls Foundation will be hosting the inaugural Bradford Bulls Poker evening on Monday 11 May, and BullBuilder are among the supporters of the event. The event forms part of ‘Robbie’s Big 10’, in association with the Foundation and The Forget Me Not Children’s Hospice, with proceeds being split between the two charities. The evening will be held at Grosvenor Casinos in the Bradford city centre Leisure Exchange, starting at 7:00PM. Not only will the entire Bulls first team squad be present, but BullBuilder will be there too. We have secured a table of five people, and BullBuilder members are invited to get in touch to claim one of five FREE places for BullBuilder members at our table. BullBuilder Deputy Chairman Mike Farren said, “BullBuilder and the Foundation are working together more closely than ever, and we wanted to show our support for Robbie’s Big 10 initiative. Given that our remit is to raise funds to support young players at the club, we did not want to spend BullBuilder members’ money on this, so several committee members have joined together to book a table. However, we do want our members to join us on the evening. If you fancy trying your luck and practising your poker face, drop an Email to info@bullbuilder.co.uk. 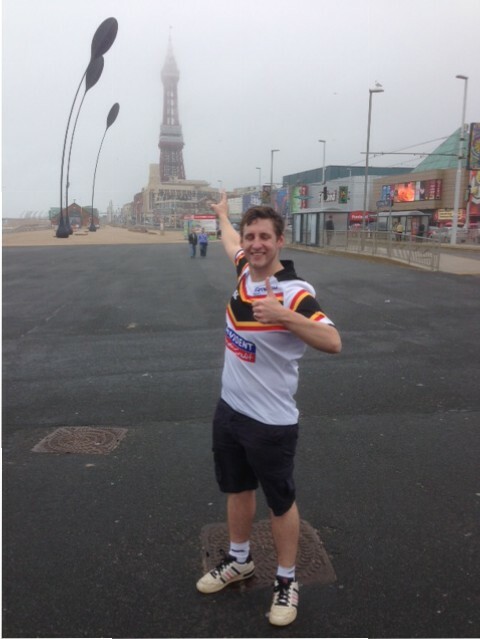 Tickets are available strictly on a first-come, first-served basis.” Robbie Hunter-Paul said, “In the name of charity, we would love to see the Bradford Bulls family secure tickets and take on their favourite players away from the field! As a trustee of the Bradford Bulls Foundation, I am proud to be working with so many fantastic partners and the Forget Me Not Children’s Hospice, who do fantastic work to support children and their families when they need it most.” If you are not already a member of BullBuilder and would like to join in order to take advantage of benefits such as this, and to help support junior rugby at the club, you can do so by visiting our website at http://www.bullbuilder.co.uk/join/. For more information, please Email us at info@bullbuilder.co.uk or write to us at Bradford Rugby League Supporters Society Ltd, Suite 2 Buttershaw Works, Buttershaw Lane, Bradford, BD6 2DD. 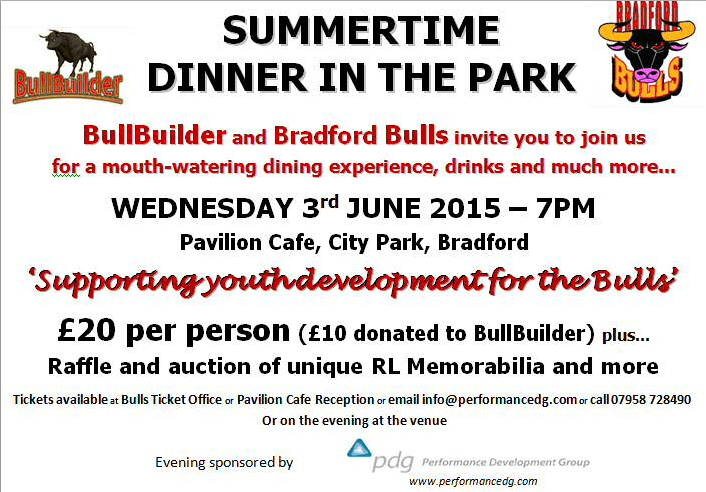 Also, don’t forget to book for the BullBuilder Summertime Dinner in the Park at the Pavilion Café in City Park, Centenary Square Bradford, on Wednesday 3rd June at 7:00PM. Tickets are £20 per person, with £10 going to BullBuilder, and are available from the Bulls ticket office (cash only) or Pavilion Café reception or email info@performancedg.com or ring 07958 728490. BullBuilder has just set the date for the 2015 AGM. It will be held at 7:00PM on Wednesday 28 January, at Cue Gardens, Stadium Mills, Stadium Road, Bradford, BD6 1BJ. We will be sending out notice of the AGM over the next few days, but we want to make sure that we reach all our members. If you are a BullBuilder member and you might have changed your Email, postal address or other contact details since you last contacted us, could you please update us? You can do so by Emailing us at info@bullbuilder.co.uk or writing to us at Bradford Rugby League Supporters Society Ltd, Suite 2 Buttershaw Works, Buttershaw Lane, Bradford, BD6 2DD. The AGM will give members the chance to shape the future for BullBuilder in 2015 and beyond. There will also be the chance to stand for the board, as we are aware that there will be some vacancies. To stand for the board - and to attend and vote at the AGM - you will need to be a current member. To join or re-join, please go to http://www.bullbuilder.co.uk/join/, or write to us at the above address. About the venue, BullBuilder chairman, Mike Farren said, "We would have liked to hold the AGM in the Coral Stand, but the club made us aware that there is a significant cost to opening the stand, particularly in Winter. Understandably, they do not want to lose money on what should be a money-making facility. This left us with a choice, either to use a significant amount of the money donated by our members and supporters to underwrite the meeting, or to take it elsewhere. As the money was donated with the express intention of supporting junior rugby at the club, we want to ensure that it is used as effectively as possible for that purpose. Cue Gardens is convenient for Odsal, and is known to fans. We're confident that the AGM will be handsomely accommodated there." Speaking of supporting junior rugby at the club, BullBuilder will be funding a team-building evening for the under-19 squad, including leisure activities and a meal, next week. Look out for details of the event!